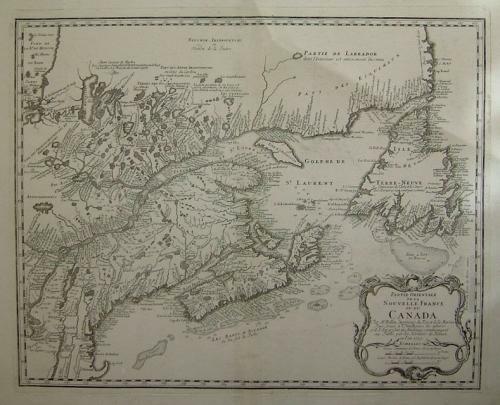 Title: "PARTIE ORIENTALE DE LA NOUVELLE FRANCE OU DU CANADA"
A detailed chart of Eastern Canada from Newfoundland, Nova Scotia and the Gulf of the St Lawrence as far up as Quebec and onto Lake Ontario, all shown in some considerable detail for the time, with numerous place-names round the coasts. Soundings, shoals, with the coastal contours in original colour. Ornate title cartouche at lower right. In very good condition with full wide margins.